“Each of us would tell you that the Bikeway is a valuable asset to the community and that the calls for service on the bikeway are insignificant when compared to the calls for service we recieve generally. The Minuteman bikeway had its detractors when it was in the planning stages, however none of the fear proved to be based on reality." "We do not patrol every street, park, or other location in Lexington every day and we don't patrol the bikeway every day. Stoneham will not either"
"The Minuteman bikeway has not generated any additional expenses for the Police Department and it actually gives us the opportunity to interact with the public (the general public) on a much more frequent basis." See below for an interactive Google map of the route. Below that are a few screen shots from the 75% plans that may be of interest. Each image is clickable for a larger image. Above is an interactive google map of the full route. 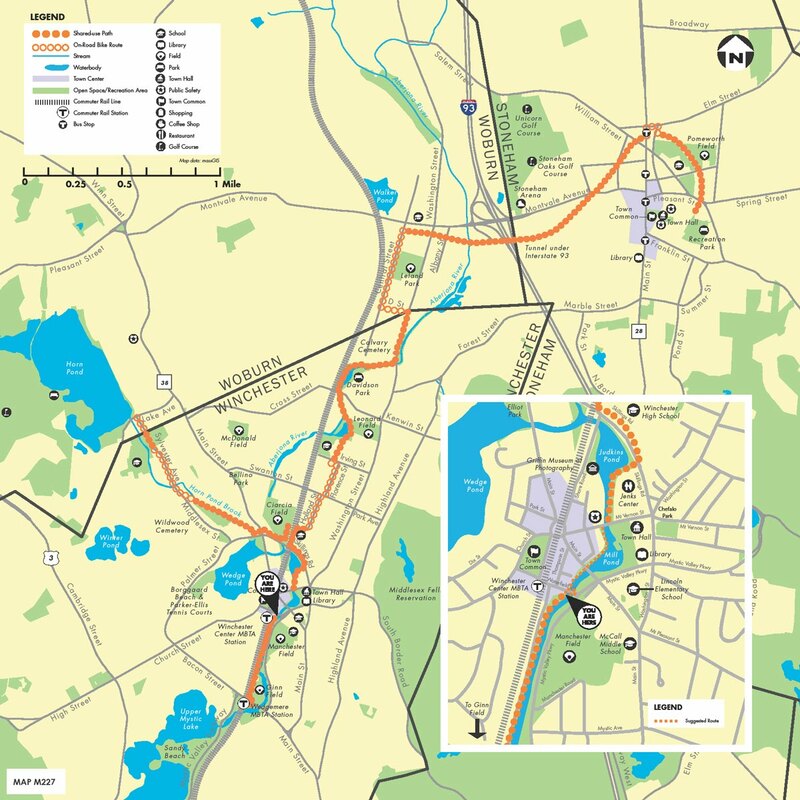 The trail goes from Wedgemere Station in Winchester to Recreation Field in Stoneham with a spur off to Horn pond in Woburn. The total trail is just under 7 miles. You can link out to a separate Google Map window for a larger view. Wedgemere station in Winchester is the start of the Bikeway/Greenway. Though technically one end of the trail, note that it is around the corner from the Mystic Valley Parkway which is a beautiful location to continue your travels. The spur into Woburn terminates at Horn Pond. Another great location to tour on a sunny day in summer or winter. How on earth will the trail cross I93 you ask? You drive over it every day. There is an old train tunnel under the Montvale Ave exit as the path transitions from Woburn to Stoneham. There will be benches, historical markers and landscaping on both sides of the tunnel. you might even see some local young artist work as you go through the tunnel. There are a number of challenging crossings. For this example at Montvale Ave in Stoneham, the crossing was moved for site lines, pedestrian activated flashing lights will be installed and a low fence will be added to slow pedestrians at the curb. The trail ends in Stoneham at Gould Street, near Recreation Park.